Have you accidentally deleted an important file and don’t know how to get it back. Sit relax and read on this tutorial on how to restore any precious files that has been accidentally deleted or formatted from USB, memory card, internal or external hard drive, CD/DVD, different portable devices and other similar storage devices. 321Soft Data Recovery for Mac is a powerful utility that helps user easily restore their trashed or formatted hard drive data in just a matter of time. It has dedicated recovery options to undelete files from USB, hard disk drive, Optical media, multimedia/mobile device and RAID configured drives. 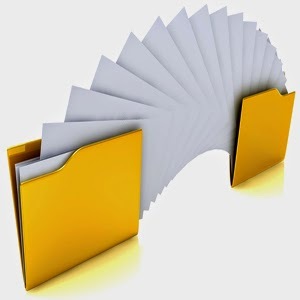 How to recover your important files and folders? Once the file has been lost from the problem storage media, it could be difficult to restore or recover it if you keep using the drive for some time. Weather it has been deleted from the internal storage device or any external media, you’ll need to ensure that no further copy/move operation has been performed since the time when data loss situation strikes. The software offers pretty simple and easy to use wizard based recovery steps so you could recover your data exactly in the form it was before deletion. HFS, HFS+, FAT16, FAT32, NTFS, Ext2/Ext3 file system, latest packet writing such as ISO9660. 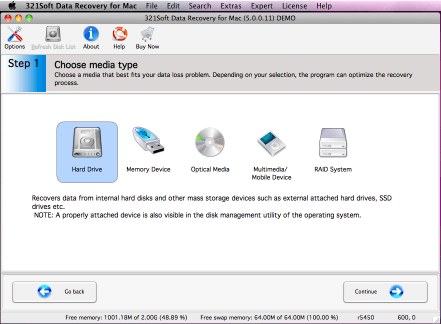 321Soft Data Recovery for Mac includes powerful RAID constructor to rebuild or reconstruct damaged/corrupt RAID arrays. Later, it helps you to recover data from Mac computer RAID configurations such as RAID 0, RAID 1, RAID 2, RAID 5 and RAID 6. The software equipped disk cloning/imaging utility to create a complete disk image or clone copy which you can use to perform recovery at any convenient time. Make sure the created image or cloned copy is stored at secure place that is free from virus/Trojan attacks. At last, the software solely works on wizard based interface to let computer illiterate users recover their lost or deleted data like pros. Incredibly easy and WYSIWYG based navigations makes it clear to achieve maximum possible recovery in shortest possible time frame. You’ve the capability to slim the search results by defining parameters of desired deleted files you’re looking for, such as their file types, file size or date and time you thing when the file was deleted. 321Soft Data Recovery for Mac is equipped with latest technologies and modified search engines to hunt for deleted, lost or formatted files from Mac OS X or higher. Software supports all the modern storage media such as RAID system or flash based storage devices. File preview before recovery works great with all type of multimedia and document files. Last but not least, you’ve one stop solution for all your data recovery needs for your Mac computer within the budget that anyone could afford. Recommended utility for Mac OS X user to handle even worst situations of data loss. It also ensures maximum data security by using cloning/imaging features of this software. Manufactures set the price tag for this software is of $99.95 USD for a single user license. Martin Cooper, one of the leaders in very initial cellular technology development once stated, “When you park your car and leave, you can’t use your mobile, but you can take your portable with you”. He along with his team at Motorola was working to produce a wireless portable mobile phone and he successfully did this. September 21, 1983, was the day when Motorola made a significant addition to human history. They introduced the very first commercially available handheld portable device in the form Motorola DynaTAC 8000X. They spent a fortune approximately about $ 100 million and 10 years of extensive experimentation before they were able to achieve this landmark. Yes, it was big, heavy, and very expensive costing around $10,000 if calculated in today’s currency. But it was the most wanted and wished product at that point. This innovative portable technology changed the world of communication and opened new horizons for folks interested in portable communication technologies. Whole world witnessed the great potential which this product had and it was the time when other companies jumped in and a race started to win more market share started. This race fired the evolutionary process in mobile technology and the living witnessed one of the most rapid evolutions in human history. I found an interesting video in which StealthLuck showed this gradual yet fast paced evolution. As of now, in 2014, we all know that cellular companies are putting in their best to come with some new features and incorporation of other interesting products into the cell phones. The beauty is that we have found smart phones our best friends as an outcome of this race. Interestingly, it appears that this evolution will continue to bring great products. And we will continue to enjoy these amazing products. Backups are the backbone of any business to run smoothly and analyze progress. The same thing applies to database backups and it is also crucial to manage it efficiently such as maintaining latest database backups, restoring them after data loss and monitoring it regularly etc. 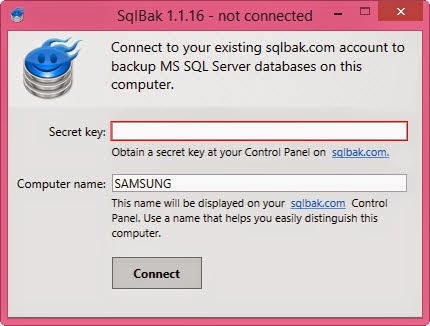 SQLBak (http://sqlbak.com/) is an amazing utility that can successfully address all your needs and ensures you the presence of latest database backups and accessible over web. 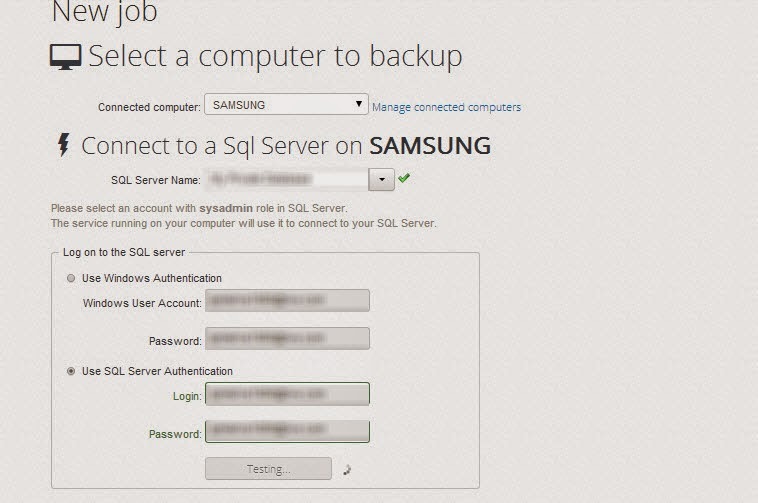 Scheduled backup for your running SQL database in organization or work station. 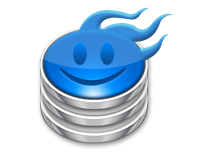 You can schedule SQL backup to any convenient time to be performed on daily basis. Moreover, you can set your Email to receive success or failure confirmation message. Allows you to restore backups from portable devices such as smartphones or tablets using the browser. 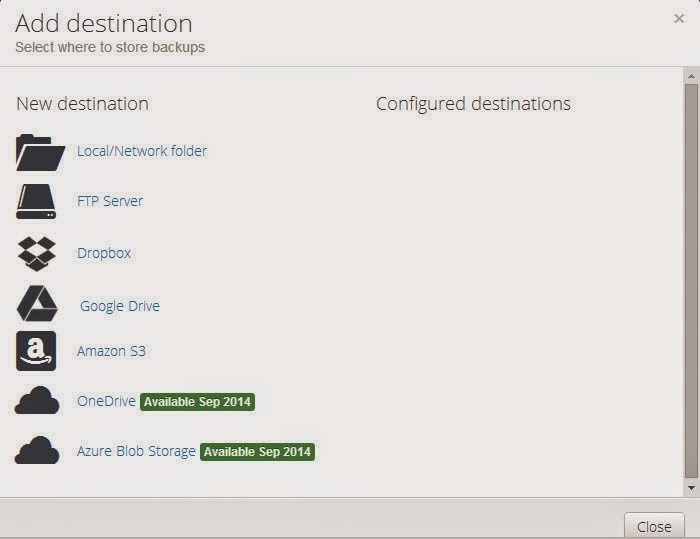 Enables user to save backup copy to various cloud hosting websites such as Dropbox, FTP, Google Drive, Amazon S3 , OneDrive and Azure Blob Storage (Available on or after September 2014). Beside this, you can also choose your local folders to stored SQL Backups, such as internal hard drive of your computer. Moreover, you can click on ‘Advanced folder settings’ to send full, differential, transaction or folder backups. You can also monitor the SQL server performance and track the job progress immediately as well as fix problems as soon as it happens. Working with SQLBak is relatively simple and takes minimum possible time. Download the setup file provided from manufacturer and install it any latest running SQL Server computer. Meanwhile, you’ll need to register a new account to get your personalized and very own dashboard to manage, schedule or maintain SQL server backup copy. Take note of a generated serial key generated during the signup process. You’ll need it to activate the program and match the source and destination of SQL backup copy. 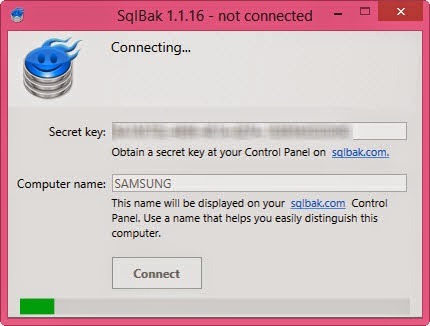 Click on ‘Connect’ after entering the serial key. The activation process will begin right after. Further steps need to be performed on the online dashboard. You can use it set source computer where SQL backup copy was stored. However, make sure you’ve any or all the required parameters such as ‘SQL Server Name’ as well as authentication method, either Windows or SQL server authentication. 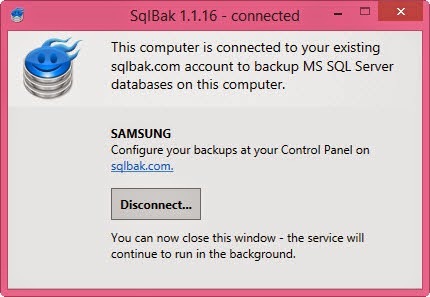 SQLBak is the most powerful and advanced utility to take backups in real time and secure proof it by storing on cloud hosting websites that has relatively slim chances of getting your files lost or accidentally removed. Moreover, it also offers compression technology to lower the size of backup copy and get maximum storage capacity against the cloud hosting website or local storage drive. Backup applications are significantly more important than any other tools these days. It helps Mac users to restore data after accidental deletion or formatting of important files and documents from the hard drive or similar storage device. Cloning is a process of making exact copy of source disk to the destination disk, by copying all your data sector by sector. Use this tool to simply copy the entire contents of the source disk to destination disk which should be of same or higher capacity. Keep in mind that the software won't delete any data stored on the destination drive and the files already stored there will be intact. P.S. The Finder doesn't make reliable clone of your Mac volume or imortant files and folders. This software is much more capable and more efficient than the Finder and performs accurate clone that is durable and ensure that not a single file will be missed. 1. It'll update files or folders, if there size is different on the source drive and destination drive. 2. It'll update files or folders, it there modification date is different on the source drive and the destination drive. In both the cases mentioned above, software can easily track changes and ensure that file has been changed as well as needs to be updated on the destination disk. Mac Backup Guru offers intuitive interface and wizard based steps to make process easier for beginners as well as for advanced users. Download and install this software from manufacture website (macdaddy.io). On the home screen of this software, you’ll find ‘source’ and ‘destination’ folder icon located at left and right corner subsequently. 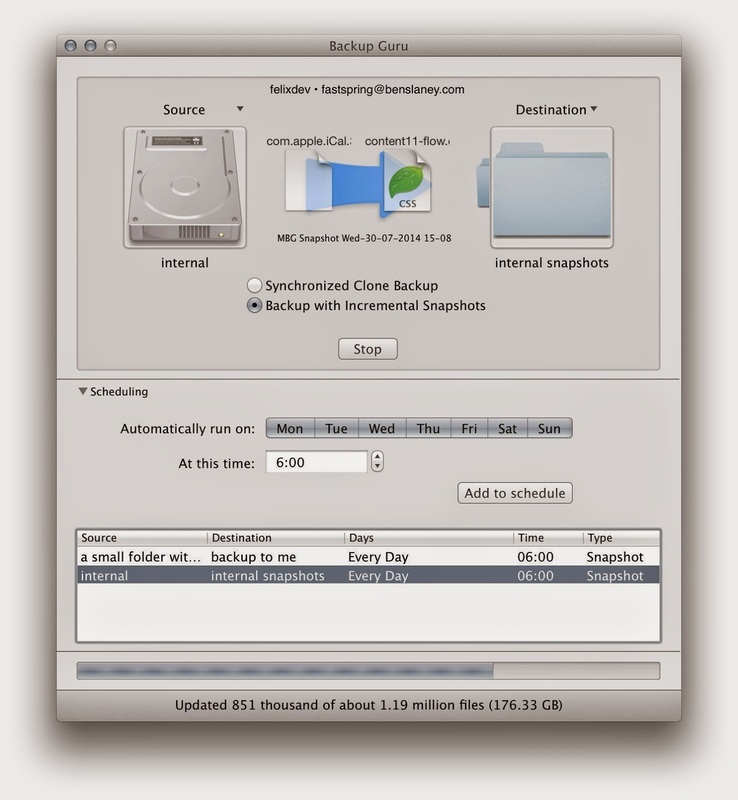 Moreover, 'Backup and Incremental snapshot' button is located at the middle of both the icon, just below the directional arrow that points towards the ‘destination’ icon. To begin creating backups/cloning, just click on the button and Backup Guru will perform its task right after. Mac Backup Guru is relatively simple as compare to any other backup or cloning utility. It is as easy to operate as manufacturer claims and makes your mac data backup process simpler than ever. It costs you around $39 USD which can be easily justified by the nature and level of result it delivers. Duplicate files sound harmless but they can make your computer a mess. They accumulate on your HDD or SSD without you knowing about it and start wasting a lot of valuable space. Worse still, duplicates make it hard for you to tell which file is the original and which is the duplicate after a while. This is why deleting duplicate files is a must. A good duplicate finder is something that you've got to have installed on your computer. It will help you free up valuable disk space, make your PC or Mac faster, and make it easy to manage your files. Here are five best duplicate file finders available today. If you are looking for an easy to use, accurate and advanced duplicate finder, Easy Duplicate Finder is for you. This program works on both PCs and Macs and is the easiest to use duplicate finder out there. It has a very intuitive three-step scanning process: all you have to do is add folders to scan, click on the Scan button and then click on Remove All Duplicates. That's how easy it is! And if you're an experienced user, you can take advantage of the program's advanced scanning algorithms and file sorting features. Easy Duplicate Finder offers file comparison by content, preview for all types of files, file groups, iTunes and iPhoto integration, duplicate email management and more. In short, this program is really worth having. If you are into photography and have a lot of image files on your PC or Mac, then you should give Duplicate Photo Cleaner a try. This special program not only finds duplicate images that are 100% identical, but also detects similar images. This is possible because it compares color changes on the RGB level or in grayscale (you can choose the algorithm you want to use). The user controls the similarity threshold and can set it to anything between 50% and 100%. Duplicate Photo Cleaner supports all popular image formats including JPG, PNG, TIFF, GIF, and even RAW on Windows computers. Plus it has iPhoto integration, which is very handy for Mac users. If you are on a Windows PC, then I bet you've at least heard of CCleaner, a very popular free PC cleanup utility. CCleaner has lots of cool features and a duplicate finder is one of them. True, their duplicate finder is pretty basic, but it's great for quickly searching for duplicates by name, date and size. This works really well for checking your PC for identical documents saved to several different folders by mistake. Auslogics is a well-known name in the PC speedup industry and its free duplicate finder is another popular choice. Even though it has a somewhat basic design, Auslogics Duplicate File Finder has a lot of useful features such as file preview and comparison by file content. It's also very easy to use and lightweight on system resources. Auslogics Duplicate File Finder is for Windows only. VisiPics is a free open source image similarity finder for Windows and Linux users. Even though it looks very bland, it has good functionality and can detect similar photos and images. It's pretty accurate too and doesn't often display false results. In any case, there is a preview feature that you can use to check the duplicates. These file duplicate finders will help you manage files on your PC or Mac to redeem valuable disk space the easy way.